The community of Pike was started in the 1860's. It was named by C. L McGowan, who was from Pike, Kentucky. The Pike Baptist Church was started in 1866 with 48 members. It was originally called Pilgrim Baptist Church. The area was sometimes called Pilgrim also. The first store came in 1887. By 1900 there were six stores, a blacksmith shop, two churches and a gin. One of the early residents was J. J. Bradley. The Bradley Cemetery is north of town about 1 mile. 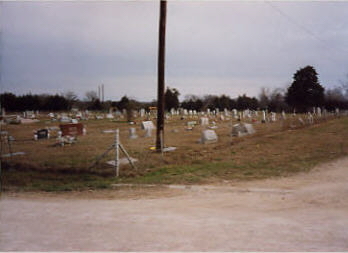 According to the Collin County deed records, the Baptist church owns 3 acres of land where the cemetery is located. The Pilgrim Baptist Church was sold 2 acres of land in the deed listed in Vol 20, p 278, by C. L. McGowan. The Pike Baptist Church building is just west of the cemetery. The Pike School was just south of the cemetery. The Pike Baptist church also acquired that land. This cemetery is fenced with a 4-foot wire fence. 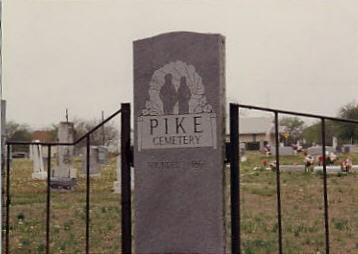 There is a marble tablet on the west that says "Pike Cemetery, established in 1866." That is the same year that the Baptist church was started. The cemetery has no trees. It is well maintained and appears to be active. There are at least 200 burials here. I did not see very many old stones in the cemetery.